In today's constantly connected digital economy, it's no longer enough to simply operate a great veterinary hospital – it's about being certain that customers can pick your small business out from all the noise. To put it simply: unless your veterinary hospital's website is one of the top 3 search results delivered by Google, Bing, and other search engines, you may never be found. Your practice needs veterinary search engine optimization, one of the most vital tools for complete online marketing, to be visible online and make the most of your veterinary marketing campaign. VetNetwork can help. Search engine optimization refers to the practice of using specific keywords within your website content to ensure that people looking for veterinary services in your local area find you. It also requires you to update your website frequently with fresh content such as veterinary marketing blogs, videos, press releases, and new product information. Having fresh content makes your site more valuable to Google and the other search engines, thus earning you a higher rank on search engine results pages (SERPs). While most veterinary practice owners know that they need these things, finding the time to do them is another story. That’s where VetNetwork enters the picture. We will put our years of veterinary SEO expertise to work for you so your clinic has a steady supply of new families. This allows you to focus on caring for animals, which is the whole reason you chose your profession in the first place. VetNetwork offers custom veterinary SEO plans designed for your unique practice and your specific location. Subscribing to one of these affordable SEO packages can help launch your veterinary hospital website into the top 3 rankings no matter where customers are searching online – from popular search engines like Google, Yahoo, and Bing to localized services like Google Places, Yahoo Local, CitySearch and SuperPages. 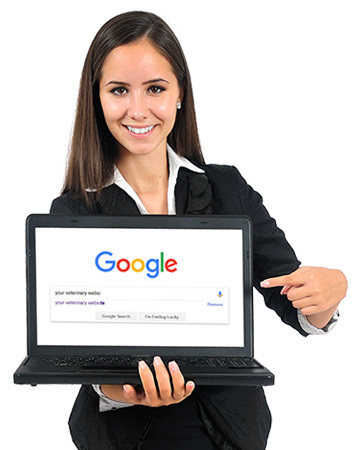 Research has proven that most online searchers do not look past the first page of SERP results. Many do not even consider anything beyond the first three listings on page one. People care about their pets as beloved family members and are willing to spend money to keep them well. You can make sure that your veterinary clinic is a name they see when searching when you leave your marketing to VetNetwork. We offer a variety of customized SEO marketing and management packages designed to meet your expectations and budget. You can choose anything from a starter veterinary SEO package to a platinum package to ensure that your website retains its rankings and your veterinary practice establishes itself as an industry leader. We will build your authority and continue to monitor and tweak our efforts to ensure that you remain ahead of the pack. To discuss a veterinarian SEO program that is right for your hospital's practice, please call us today at 800-564-4215 or use the form below to contact us online. We will review our options with you in greater detail and help you evaluate which services your veterinary practice requires now and in the future.